Random House Books for Young Readers, 9781635651690, 128pp. Travel around the United States of America with twins Finn and Molly in this new chapter book series that highlights a different state in each book! Magic and mystery from sea to shining sea! Say hello to the Big Apple! 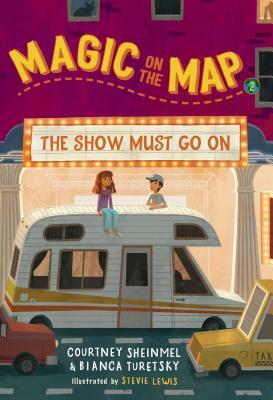 PET, the magical camper, has surprised Finn and Molly Parker with another mysterious trip--this time to New York City, where they meet kid star Hallie Hampton. Hallie needs the twins' help to win a scavenger hunt before the curtain rises on her opening night. It's loads of fun ... except that Finn and Molly are doing all the work! Courtney Sheinmel is the author of over a dozen highly celebrated books for kids and teens, including the young readers’ series Stella Batts, the middle grade series The Kindness Club, and the young adult novel Edgewater. In addition to writing, Courtney served as a judge on the national level for the Scholastic Art & Writing Awards, and she received a National Scholastic Outstanding Educator Award for her work as a writing instructor at Writopia Lab, a non-profit organization serving kids ages 8-18. She lives in New York City. Visit courtneysheinmel.com and follow @courtneywrites. Bianca Turetsky is the author of The Time-Traveling Fashionista On Board the Titanic, The Time-Traveling Fashionista at the Palace of Marie Antoinette, and The Time-Traveling Fashionista and Cleopatra, Queen of the Nile, which have been translated into 9 languages. After graduating from Tufts University, Bianca began working for artist and filmmaker Julian Schnabel, where she managed his studio for over 11 years and was his assistant on the Academy Award-nominated film The Diving Bell and the Butterfly. She is currently the regional Brooklyn coordinator and an instructor at Writopia Lab, an award-winning non-profit that offers writing workshops for kids and teens from all backgrounds. She lives in Brooklyn, New York. Visit biancaturetsky.com and follow @BiancaTuretsky. For half of the year Stevie Lewis travels out of her van, furthering her passion for art and the outdoors. She is also an avid hiker and rock climber. With a background in animation, she now illustrates children's books, including Sun! One in a Billion, by Stacy McAnulty, Prince & Knight, by Daniel Haack, and Lost in the Library, by Josh Funk. She is currently based in northern Arizona, where she lives with her partner and two dogs.